Buhari’s 2019 Declaration: Game Changer or Game Over? It was an irony of sorts coming from Senator Ovie Omo-Agege when he told Sunday Vanguard that President Muhammadu Buhari’s declaration for a second term was a game-changer. The declaration was, of course, a game changer for the Delta senator as he was suspended from the Senate for his unbridled enthusiasm for Buhari’s second term by his colleagues. Even as Omo-Agege is now engaged in battle with his colleagues and constituents over his role in the Buhari second term saga, mixed reactions have trailed the Monday declaration by the President. 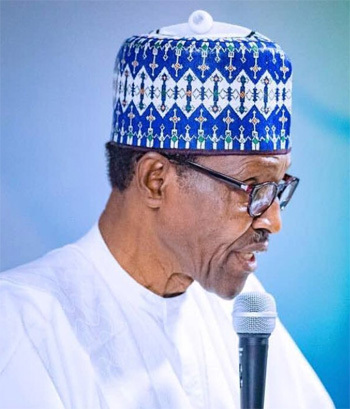 Buhari had seized the opportunity of the National Executive Committee, NEC, meeting of the ruling All Progressives Congress, APC, to inform the senior party stakeholders of his intention to seek a second term in office. The announcement at that forum was largely unexpected given the internal storm that had, at that time, gripped the party over the future of the John Odigie-Oyegun-led National Working Committee, NWC. After the announcement, the President, same day, proceeded to the United Kingdom ,leaving behind a trail of reactions to his parting shot. The reactions have focused mainly on the achievements of the administration against the promises it made. Other points of focus are on the health of the President, his application of federal character in appointments, the economy and state of security. Expectedly, reactions to the Buhari’s second term declaration varied according to political and personal proclivities. Among those who welcomed the re-election bid was Governor Simon Lalong of Plateau State, Senators Omo-Agege, Sabi Abdullahi and Abu Ibrahim. While Lalong and the APC senators spoke excitedly about the President’s declaration, outside the corridors of power, the announcement was met with either indifference or sheer hostility. If Buhari decided not to contest, the APC meeting (NEC meeting) would have ended up in a combative situation, it would have been an explosive situation. We will engage the South and other parts of the country. The meeting would have been very serious and it would have been very difficult to control. I was joyous, elated, I think that was the right thing to do. If Buhari decided not to contest, it would likely have led to disintegration of the APC; it would have created confusion. I want to say that the declaration saved us that confusion. In Nigeria, we are on the path of recovery, we are on the path of rebirth. If this gentleman continues for the next four years, Nigeria will be better. Of course, there are problems here and there, but the President has addressed most of them, he has dealt with Boko Haram, we are happy to have achieved that. I am pleased and happy that our President has formally declared; ending all speculations. I join other party members and loyalists in the joy of this development and pray that Almighty Allah will grant him good health, patience, tolerance and wisdom to continue to steer the ship of state to peace and prosperity for all Nigerians by consolidating on the successes recorded in economic restoration and growth, security of lives and property and the fight against corruption. A very good development. Though not surprised, the declaration is a game changer. We now have our work cut out for us. We have to hit the ground running. If we are allowed to put out the real narrative, that he has delivered on his major campaign promises of arresting the security challenges posed by Boko Haram, improving on the power situation in the country, improving and stabilising the economy and addressing the welfare of the weakest and most vulnerable in the society, the President will win and indeed win big. We will be challenging our opponents to a contrast of the last three years with the last 16 years of failed governance by the opposition. The declaration is an indication of the President’s firm belief in democracy and the rule of law, the President has equally demonstrated that he is willing to submit himself to democratic processes and the will of the people rather than submit to the wishes of a few. The President made it clear that his declaration is as a result of a popular clamour by Nigerians thereby reinforcing his belief in listening and rendering service to the people. So for us, it is a positive response to our wishes and an affirmation that the President is a listening leader who is committed to doing what is in the public interest. Others, including a Senior Advocate of Nigeria (SAN), Mba Ukweni, and a former PDP governorship aspirant in Delta State, were, however, more hostile and opposed to the president’s re-election bid. Senator Ahmed Makarfi, on his part, said that it would have been a shock if the President decided not to contest. In an interview with Sunday Vanguard, Makarfi said, “It should be news only if the announcement had been that he will not seek re-election. For the PDP, our expectation has always been that he will run; so nothing changes in our resolve to do the needful”. The Chairman of the national leadership of the opposition party said the PDP was prepared for the 2019 presidential contest and was ready to give him a fight in the interest of the country. In his reaction, the Kaduna State spokesman for the PDP, Mohammed Rigassa, said the declaration of Buhari was a non-issue. Ukweni (SAN) said it wasn’t a surprise that the President declared his intention to re-contest in 2019 despite his abysmal performance. In an interview with Sunday Vanguard, he lamented the poor performance of the administration, saying that if Buhari would be in office for a second term, inefficiency will continue. The post Buhari’s 2019 Declaration: Game Changer or Game Over? appeared first on Vanguard News.